Bernie Sanders has long been regarded as an underdog to long-time favorite Hillary Clinton in the race for Democratic presidential nominee. But is that changing? Maybe. According to The Hill, Monmouth University released a poll last Wednesday finding that since April, Clinton has dropped nine points, while Sanders has gained 10. His jump is greatest in Iowa and New Hampshire — the first states to hold primaries in the 2016 election. Sanders has been on the road campaigning, and all poll numbers aside, over the weekend his support in historically Republican voting states was strong. The socialist Democrat has some relativity radical stances on education, raising the minimum wage, and the environment. At the center of his campaign is the increasing economic inequality that plagues the United States. "What I’m doing in this campaign is trying to tell the people the truth," he said at a recent event in Iowa. "So let me lay it out on the table for you. You’re living in a country today which has more wealth and income inequality than any major industrialized nation on earth." His supporters have truly been feelin' the Bern. 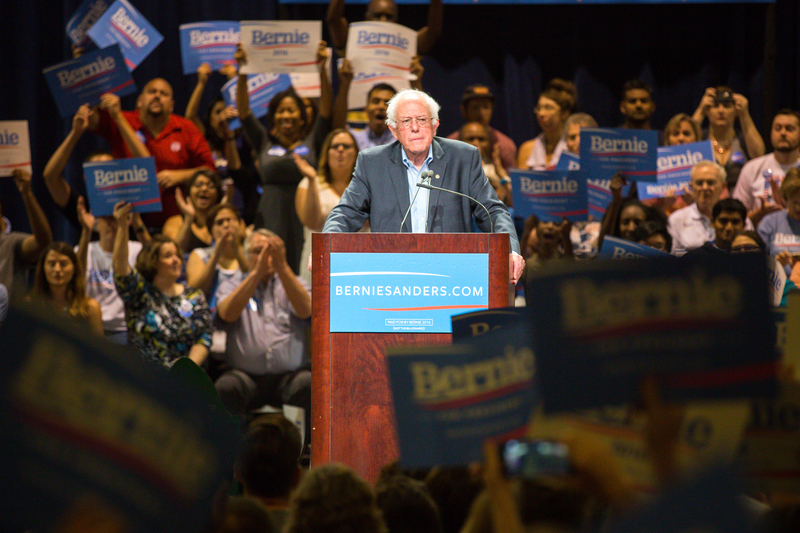 Over the weekend, Sanders headed to two major red states, Arizona and Texas, for a successful weekend. If you missed it, here's what went down. My Republican friends think that the CEOs of large corporations are the job-creators. You know who the job creators are? You are the job creators. When working people have money in their pocket, they go out and they buy goods and they buy services, and when they do that, they create jobs. But when millions of people have nothing to spend, we're not creating the jobs that we need. Hitting the environment, he urged action: "We have the moral obligation to lead the world in transforming our energy system." Sanders announced his single payer health care plans, saying, "health care must be seen as a right, not a privilege," and was greeted by overwhelming cheers. Didn't get enough? Watch his entire speech. Warning: May inspire. When we have so many of our young people in jail, to me it makes sense that we invest more in jobs and education rather than jails and incarceration. He also spoke out against police brutality, citing Eric Gardner and Freddie Gray. These are the cases that you have heard about recently but anyone who thinks this has not been going on decade after decade would be very wrong. It is unacceptable that police officers beat up people or kill people. If they do that, they have got to be held accountable. With traditionally red states Arizona and Texas feeling the Bern, Sanders is proving himself to be a truly viable candidate in the election.